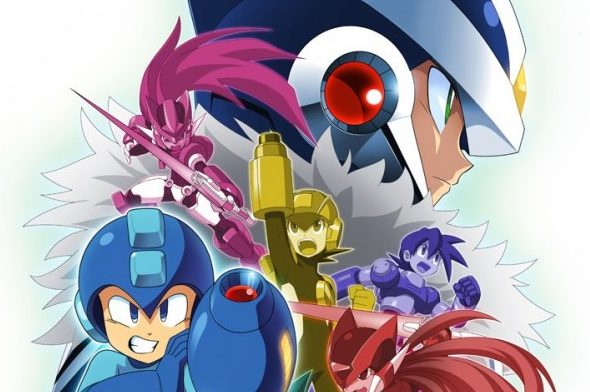 Despite this week's Famitsu report, we still don't know all that much about Rockman Xover. However, more details should come to light as the game is scheduled to go playable at the Tokyo Game Show on September 20. The good word comes directly from Capcom's Tokyo Game Show special site which lists Rockman Xover as one of the many games set to appear on the showroom floor. What's more, those who visit the "mobile corner" will get a mobile screen cleaner set that includes an OVER-1 cleaner. If you drop by TGS, by all means send along your impressions of the game. I think we're all very interested to hear how this one plays. Rockman's getting all these cameo appearances after the L3 shitstorm...maybe there's something around the corner? The new era Classic games are rather easy to make, so maybe another sequel for the 25th anniversary? I mean, Xover can't be the anniversary thing, right? Capcom Unity continually assures us that Xover is not all there is and we'll know more in December. And I'm hopeful to that. The guy who's doing all the assuring is Sven and he's been making vague half promises since the news on Universe was slow saying it was going through "heavy changes". He might be a big part of COA but it's COJ who make all the decisions so his word isn't really reliable. In all honesty, at this point, I would be content with the 25th anniversary celebration simply being a revealing of the as-of-yet-undiscovered "secrets" in MM9 and MM10. You know a new Mega Man iteration. ... I almost want to say I'm surprised, but I'm not. They're full of morons at Capcom now, so it makes sense that they'd act hypocritical, anything else would be out of character at this point. Remember when we loved Capcom? Good times. Good times. You did read the article right? He wasn't speaking on behalf of the company. He was stating his own personal opinion about the Mega Man series. Also don't you think it's a bit unfair to call Capcom employees morons? I mean, I'm not happy with what Capcom has done with Legends 3 either, but is it really necessary to lash out against their employees? Agreeing with StrikeSlash here. The employees are just doing their job and have no real control over the company's decisions besides proposing suggestions that are ignored most of the time. If you're looking for someone to call morons, call the higher ups at CoJ the morons. It seemed to me the comment about too many variations was more on the fact that we got 3 sometimes 4 games a year and it diluted the market.